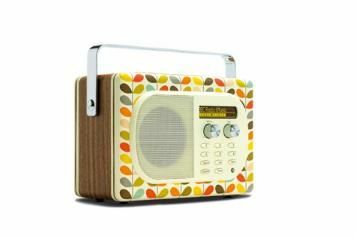 Pure Evoke Mio by Orla Kiely review | What Hi-Fi? Taking a break from hats and handbags, Orla Kiely (whaddya mean, ‘who?') has tried her hand at a designer radio. We think it's fair to say that this is one that's predominantly aimed at the ladies, but if it's to your tastes, then you'll be pleased to hear it's a Pure Evoke Mio underneath – a four-star radio that was certainly a contender in the DAB market last time we had our mitts on it. It's well specified, with DAB and FM tuners, a stereo output, headphone connection and an auxiliary input. As with many Pure radios you can add a ChargePAK rechargeable battery, yours for around £30, or connect it straight to mains power. The display is clear, it's easy to use and there's a handle should you want to pretend you splashed out on the designer handbag rather than the designer DAB. Sonically, it's a subtle, restrained performance, light on its feet – and on bass – but instead packing plenty of detail and natural voices. If it's talk radio you're after, this is a very easy, enjoyable listen. Switch to music and while it's no party-starter, it's again a comfortable listen that delivers plenty of insight and a balanced sound, if lacking a little excitement.